"This acoustic-folk-pop duo is just so damn cute. They’re like the lesbian sisters you wish you always had...."
"The phrase “oh no” is typically associated with a feeling of grief, but Hannah & Maggie are changing that with their new album. 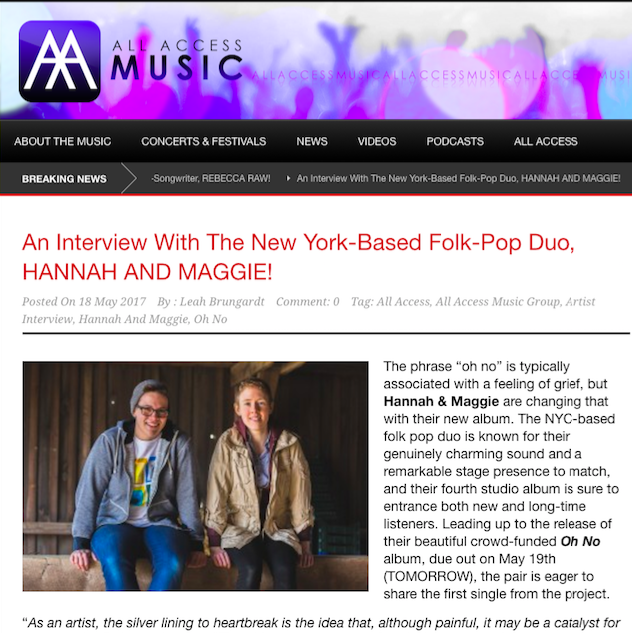 The NYC-based folk pop duo is known for their genuinely charming sound and a remarkable stage presence to match..."
"Today we've got Hannah & Maggie who are teaming up with VENTS for the exclusive premiere of their newest record 'Oh No'..."
"With each album, Hannah & Maggie have been through a different journey, and this time around, it was about finding themselves and deciding what is important to them, both as individuals and as artists..."
"There’s a general belief that best friends can and often do everything together – it certainly holds truth for Hannah & Maggie, two best friends who came together over their shared love of music which has since grown into a blossoming career in the industry. ..."
"Is it possible to have FOMO about a fictional party?..." "Q: Hi ladies, welcome to VENTS! How have you been? A: Fantastic! This album has been in the works for a long time and it’s so exciting to finally be sharing the songs that have meant so much to us...."
"There is something so sweet about the friendship between New York folk pop duo Hannah & Maggie. In the band’s new video for their sound “Back To Town,” we see Hannah & Maggie all smiles and with their friends, walking through New York as the sun sets..."
"Duo Hannah and Maggie, who reside on the east coast, are ready to release their fourth studio album Oh No out May 19th. They have been compared to Simon and Garfunkel and The Indigo Girls and their live shows have gotten rave reviews. I recently got the chance to talk with the girls about crowdfunding, tour memories, and other topics..."
"Q: First of all, can you introduce yourself and tell us what it is you do? A: We’re Hannah (the brunette) and Maggie (the blond) and we write and perform folk music wherever people will let us. We fit music into our lives whenever possible. Hannah is a music teacher in New York, and Maggie is working on her graduate degree in Western Massachusetts..."
"Acoustic duo, Hannah & Maggie, are a singing light in a sometimes dark and negative world. The duo brings charm and a warm stage presence with their sweet lyrics and music. Their music reminds fans and listeners of Indigo Girls and Paul Simon..."